Has damping off got you down? Do you weep with sorrow as your little green darlings turn brown? Do their roots sport white webbing like some Halloween decoration someone left outside until Christmas? Alas, I’m pretty familiar with this situation. It mimics my day without coffee: I may start off fine but eventually I shrivel up and collapse. Perhaps you’ve got a serious case of damping off in your own gardens. Perhaps you’re not even sure what it is. Perhaps you’re suffering from extreme paranoia and just want to avoid the problem altogether. Whatever your status, there are a plethora of ways to prevent the disease from taking over, forcing you to throw your trowel in the trash. Here you will find the information you need to keep your plants on a healthy track. You’ve started your seeds with lots of tender loving care, watching over them like a hawk over the highway looking for road dinner. You do your happy dance as the seedlings sprout, then wail in agony as they drop faster than they appeared. What happened? Usually the culprit is a fungal disease that has infected the seeds. They have fun-to-pronounce names like pythium, fusarium, and rhizoctonia. If you want to get really technical, fusarium and rhizoctonia are fungi and pythium are classified as oomycetes. But who’s counting, right? Sometimes the seeds never sprout, other times they do and quickly turn to mush soon after. It can be exceedingly frustrating to lose an entire flat of seedlings in one go. Often these fungal spores reside in the soil and can be transferred by contaminated garden tools, blown by the wind, or born by insects. Once there, it doesn’t take a lot to destroy a bed of vulnerable young plants. Seeds that resemble the morning mush you used to eat before school are a sign of contamination, usually resulting in a plant that never makes it past the soil level. Shriveling and darkening are also signs. Leaves can appear waterlogged and mushy. When disease is only present in the roots, plant growth is stunted, leading to wilting and death. Affected stems cause the plant to flop. You may even see a white, cobweb-like substance in stricken areas. While you’re accounting for your plants’ symptoms, ensure that you don’t have other culprits to blame for these issues, such as beetles and cutworms. The symptoms can look very similar, but the treatment and prevention are vastly different. So keep a watchful eye! It’s nearly impossible to avoid contaminated soil. These fungal buggers are everywhere and do very well where they are, thank you very much. The potting soil in combination with shared water makes it easy for them to travel from seed to seed. The warmth of indoor conditions get these party crashers going. That’s not to say you should curb their fun by planting in cold soil. This would slow the growth of the seedling, allowing much more time for disease to spread and take firm hold. A balance needs to be found with temperature, watering and lighting amounts, and fertilization. 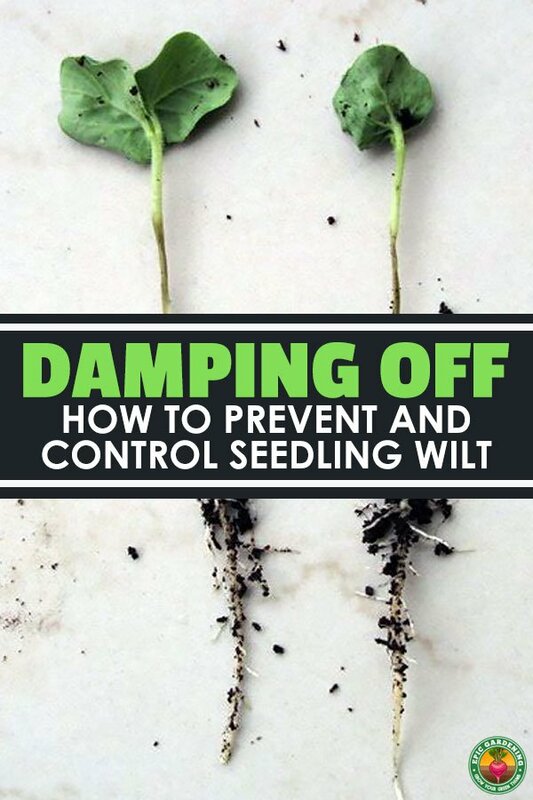 There is no cure for damping off once it has started choking your plants, nor are there fungicides available for garden warriors to do battle, so it’s all about control. You can prevent damping off by following just a few simple techniques and pieces of advice. There is some debate on the subject of sterilizing your growing medium. It is an oft recommended technique for preventing fungal spores from ruining your seedlings, such as baking your soil at 140 degrees for 30 minutes. Other schools of thought believe that these methods kill off beneficial microorganisms that would otherwise keep pathogens in check. 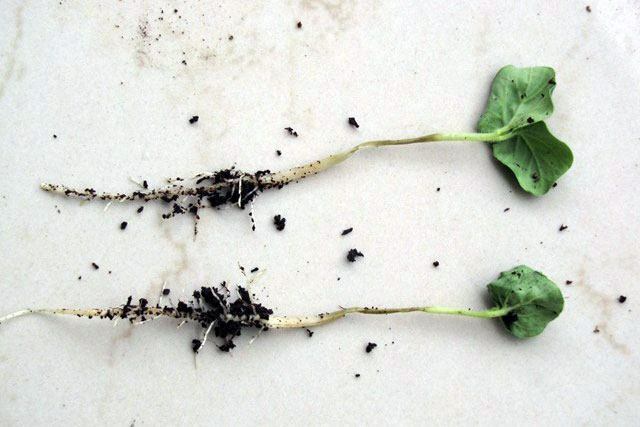 Whichever you choose, it is probably best to use new potting soil for your seeds every time, perhaps even consider pasteurized or treated soils. If you are using your own soil from outdoors, that’s when giving it a good roasting might be a good idea. While you’re figuring out whether to bake your soil or not, make sure you’ve chosen a well-draining type of growing medium. As your favorite gardening implements can carry those nasty spores right into your new seedling flats, make sure everything you use is clean prior to sowing. This may mean cleaning them yourself or using only new containers for your babies. It’ll never hurt to clean your tools before or after every use, even your hose. Yes, that long, green snake may be dragging the bad guys right where you don’t want them to go, so keep an eye on where it lies. When sowing your seeds, keep it light and shallow. Too many seeds cause crowding, making evaporation more difficult. 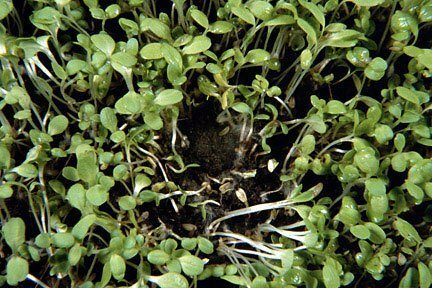 Sowing too deep will drag down the seedlings’ growth speed, giving pathogens more time to strangle their hosts, and reduce air circulation. For indoor sowing, consider using a heating pad to warm the soil around 70 degrees. For outdoor, check the temperature of the soil prior to planting. Wait until the earth has reached optimal warmth for the plants you choose. Grow lights are recommended to avert damping off. Sufficient light amounts will help the new plants grow vigorously, building quick resistance to disease. A window will not usually be enough. Shoot for at least 12 hours of light, perhaps as much as 16 hours. Speaking of warm, consider using clean heated water on your seedlings. Cooler water will slow down the growth process. Try to water from underneath rather than overhead, which makes things soggy and gives pathogens an edge. For outdoor gardens, keep your watering time before noon to allow ample time for evaporation. As you’re probably tired of hearing by now, the damper, cooler temperatures of evening will give the fungal spores an advantage over your darlings. It may be best to wait until you see a few true leaves on your plants, then use only a quarter of standard strength fertilizer. Most potting brands have their own added anyway, so you may even be able to skip this. For outdoor gardens, rotate your crops every year so you’re not growing in the same spot over and over. If you ignored or forgot the earlier suggestion of sowing seeds lightly (I’ve never ignored advice, no matter what anyone else might tell you, ahem), you may discover your sprouting seedlings need thinning in order to keep air circulating and evaporation optimal. To avoid the frustration of losing plants to damping off, think of these suggestions as coffee for your greenery. Getting them off to a clean, vigorous start will help them fight off whatever might attempt to plague them. Once they are past the vulnerable stage, they will start making their own “coffee” and cheerfully greet you every day rather than collapsing in little heaps. I think I need to go fire up my coffee pot. I hope you found this article useful and share it far and wide with your fellow gardeners. If you have any tips or experiences of your own, please offer them up in the comments. Thanks for reading!